Yesterday, I shared the concept of diminishing returns in email marketing. We predict how much a customer will spend in email marketing, annually, and then we apply costs and profitability estimates. Here's the fundamental problem with email marketing. Email marketing is synonymous with discounts and promotions. 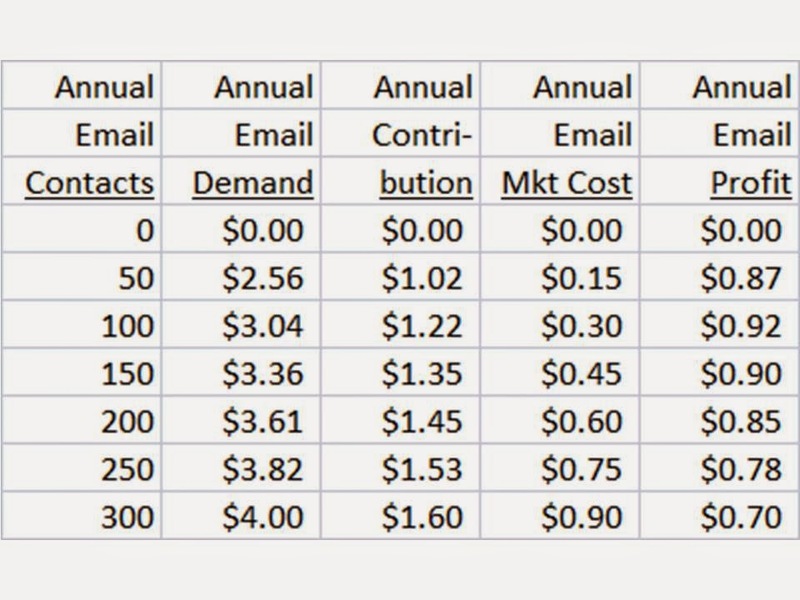 Email marketers ruined the discipline between 1997 - 2001, when, in a mad dash for monetized eyeballs, email marketers gave away the farm to get orders. 20% off, 30% off, free shipping, gift with purchase, 70% off clearance items, you name it, email marketers have done it. 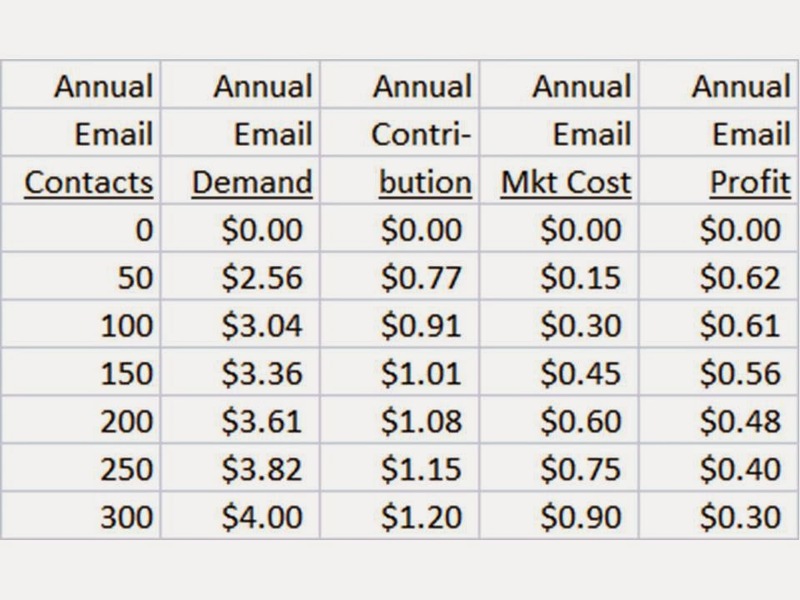 When I analyze client data, it is terribly common to observe profit factors that are seven or eight points lower for email than for other channels. This happens, of course, because email orders are disproportionately skewed to discounts/promos, and therefore, convert less demand to profit. In the example above, 40% of demand flows-through to profit. Let's assume that is the company average. Now, let's assume that the email average is 30% - because of heavy discounting and promotions, only 30% of demand flows-through to profit. What happens to the profit and loss statement? 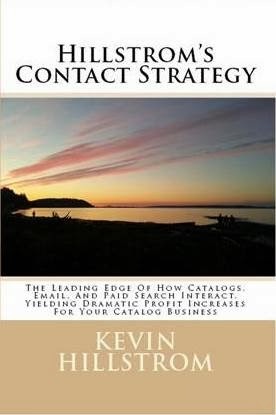 Optimal profit now happens at 50 contacts a year, not at 100 contacts a year. Once again, discounting and promoting yields a bunch of unanticipated side effects. Are you performing this style of analysis? Do you use this style of analysis to determine how many emails to send to a customer, annually? If not - contact me now (kevinh@minethatdata.com). Profit is laying on the ground, waiting to be picked up! Or buy the book (print click here, Kindle version click here). Non compliance of such issues is now very common. And for willing ful non compliances there are hefty penalties also prescrivbed under relavanbt act. One more such are is Section 185 of Companies Act. Manier times its required to take such actions, Withdrawal of pre 2005 currency notes may be due to some reason which can not be solved out as it is.